Leek and Sweet Potato Soup is a yummy soup using bone broth. It is easy to make. Leeks are in the onion family, but are milder. They are one of my favorite vegetables. In order to keep grit out of your meal, you have to wash leeks well. They contain many layers and grow in sandy soil, so they often have sand trapped between the layers. 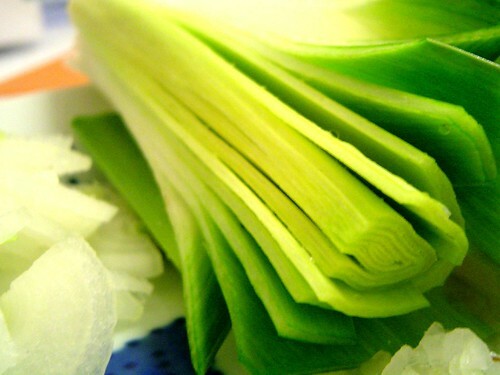 To prepare them for cooking, slice off the end and the tips then cut the leek in half length-wise. Slice each length into thin half-moons and place into a large bowl of water. Swish the leeks through a few changes of water until you see no more sand, then drain them and proceed with your recipe. I like to serve a cup of soup to each family member prior to dinner to help get a daily dose of stock into them. This is the best strategy for nights where I am not making a meal that is heavy with bone broth. In a stockpot, heat the oil over medium-high heat. Add the carrot and leeks and saute until tender but not browned, about 5 minutes. Add the sweet potato, garlic, salt, stock, pepper, thyme and dill. Cook until the sweet potatoes are tender, about 20 minutes. Add the coconut milk. Mix the cornstarch with an equal amount of cold water and whisk until smooth. Stir into the stockpot. Bring to a boil and cook until heated through. Because we had company this weekend, I didn’t get in the bone broth I wanted. Yesterday, I ate some soup and tonight I will be making chicken and dumplings to get caught up with my intake. What’s cooking at your house? How are you doing with the challenge? Thanks for the tip about cleaning leeks. I did not know that, so will bear it in mind for next time.